If you are facing difficulty in deciding what to gift your mother on mother’s day, look no further than this article. You may be apprehensive about gifting something as ordinary as a non-stick cookware but that will definitely change when you see the look on her face when she opens the gift. A smile so wide that it changes your perception about these ‘ordinary’ household appliances. You can consider gifting this to anybody who loves cooking and you might be met with the same reaction. There must be a category of people out there who still don’t seem to understand the importance of these items. Well, it makes life a little bit easier for the people that cook. It’s easier to cook in, it’s easier to clean and they turn out to be much more durable when compared to regular cookware. 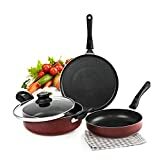 So how do you evaluate these non-stick cookware items? You can look at two things in particular. Firstly, its average lifespan (durability) and secondly, it’s quality. Although these two are inter-related aspects, there are few subtle differences in them. Durability: When we talk about durability, we look at how the cookware will last. For how long, will it’s non-stick coating remain and fulfil the utility for which it was purchased. Generally, items such as non-stick cookwares, last a middle income family for quite sometime. Therefore, before purchase ask the shopkeeper or read reviews about the product, about how long the non-stick coating lasts realistically. Quality: As discussed earlier, quality and durability are inter-linked aspects. The better the quality of the raw materials used in the production of the set, the longer the durability. At least, that’s what the general scenario is like. But in addition to the durability aspect, quality is also reflected in how heat resistant the cookware is, or, whether in time there is the possibility of the accumulation of rust on its handles and things like that. 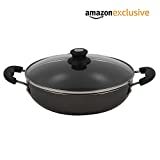 We have also picked our own choices to give you more idea and information about top non stick cookware in India.Check the below list and choose one that can best serve you. Although cookware doesn’t come under the category of items that are generally extensively purchased online, there is no harm in using the internet for preliminary screening to the very least. So here are five options that we think you can look at. Not all the non-stick cookware sets are compatible with induction stoves. But this one is. It comes in a set of 4 pieces; a tawa, a frying pan, a kadai and a glass lid. All, non-stick cookware. The primary material used is aluminium thereby making it easy to clean and heat resistant as well. Overall, it’s a nice, affordable non-stick cookware set for a small house or a house with limited cooking. Pigeon is a well known brand when it comes to cookware and has a substantial market share, in the organized sector at least. This non-stick cookware set is the ideal gift for a newly married couple or somebody moving into a new house and things like that. It comes with 8 pieces. A frying and a tawa, along with 4 pieces of kitchen tools. Great care has been taken in the design of these items, with special care taken of the handles especially. They have been designed to make these items easy to use and last long. As with most of the cookware, aluminium is the primary raw material used which makes it heat resistant and easy to wash. We can see technology used in this cookware set, pure coat technology to be precise, to make the non-stick surface extremely durable. One of the more complete cookware sets out there, this comes with 10 separate pieces. One may think it is designed for a south Indian household as it comes with a dosatava and an appampatra. The other eight pieces that come in this set are; a frypan, chapatitawa, deep kadhai, saucepan, taper pan, tadka pan, sandwich toaster and an appachatti. Although the base material of the products is aluminium, they are double coated with Xylan. As the name suggests, all the pieces in this cookware set are dual compatible, with both; induction and gas cooking. It comes with 6 pieces, each of which have 3 coating and are 3 millimeters in thickness. A couple of glass lids too, come in this kitchen set. It includes an omni tawa, two different size frying pans, a multipurpose pan, a saucepan and a kadhai as well. Prestige have taken a step towards being the pioneers of durable non-stick kitchen cookware. 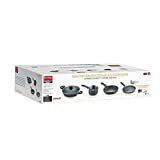 These Omega cooking sets are designed to last three times longer than a normal cooking set and are designed using the help of German technology. One of the other underlying features of this set is that all its pieces come with a thick base that help in retaining heat and cooking the meals faster. Similar to the kitchen set mentioned above, this too, comes with a lot of additional features which aren’t there in ordinary kitchen sets. The entire set consists of 9 pieces, all of which are triple coated, 4 millimeters in thickness and metal spoon friendly. It too, comes with a non-stick coating derived from Germany. The handles that come with all the pieces don’t get heated up and easily and are designed in such a way so as to make cooking easier. Because of the thick base, the food gets heated much quicker and the heat is distributed evenly. As it can be seen, it is very similar to the above mentioned kitchen set, with more pieces and few subtle differences here and there.